Whilst loading a recently killed buffalo into the back of his truck, veteran South African hunter Claude Kleynhans was killed when another buffalo caught him by surprise with a lethal charge. 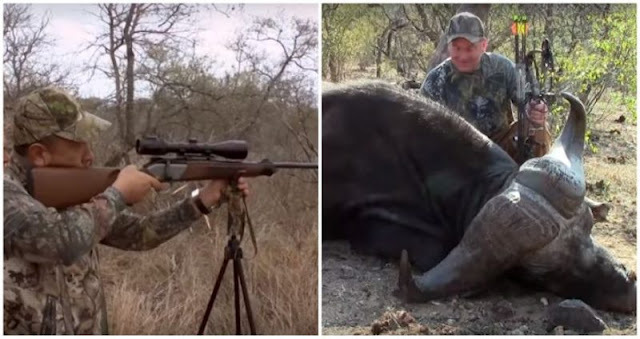 The trophy hunter had been stalking and killing the wildlife of South Africa for three decades but after a long career one of his favourite targets put an end to his exploits. Kleynhans was with a party hunting buffalo in Limpopo province when the incident occurred. According to a local news source, The Bosveld Review, Claude and some of his companions were loading their recent kill onto the back of their truck when another buffalo from the same herd came charging in goring the hunter in the groin. The buffalo’s horn severed Claude’s femoral artery, and he died shortly afterwards. The Cape buffalo, if threatened can be extremely aggressive, territorial and have been known to fight off multiple lions in defence of their offspring or if they have to protect the herd. Kleynhans hunted big game in the area for three decades, his company organised tours, hunts and photography trips. The company, Guwela Safaris, offered acommodation and food, on the menu was a list of many of the animals that a hunting party would be shooting that day. The company had operated for years and claimed that they hunted in an ethical manner but that didn’t stop many on social media calling him a poacher who deserved his fate. While Claude certainly wasn’t a poacher, it’s clear that many disagree with big game hunting. Claude Kleynhans, left behind a wife and three children.